Flue Steam is Southern California commercial kitchens’ most reliable source for complete air control and fire prevention services. 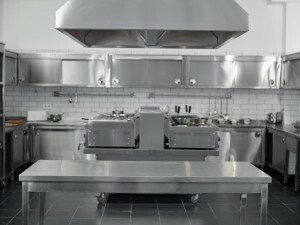 Commercial kitchen managers have depended on Flue Steam since 1971—that’s over 40 years! Many restaurant and hotel kitchen managers have been partnering with Flue Steam for a long time – some even decades! Begin your partnership with Flue Steam and you’ll be able to stop worrying about your kitchen air control or fire prevention tasks from now on. You’ll always comply with the law, dramatically reduce the risk of kitchen fires, and provide your employees and customers with a totally safe place to work and enjoy a meal. Flue Steam looks forward to building a lasting relationship with you, and making your life much easier! We’ve developed a solid reputation for dependability and customer satisfaction. We offer a whole range of service to our clients. We offer complete kitchen exhaust system cleaning – including hand scraping and steam cleaning services. We clean fans, hoods, and ducts. Many managers opt to schedule hand scraping every two weeks or so, and steam cleaning every month. Depending on how much oil and grease is used in your commercial kitchen, we may recommend more or less frequent cleaning to stay up to code, prevent fires, and ensure your kitchen stays safe at all times. We also provide grease filter exchange service, swamp cooler maintenance, and exhaust fan maintenance. These tasks are all essential to maintain the safety and efficiency of your kitchen. Additionally, we service your automatic fire suppression system and portable fire extinguisher. We can see you a fire extinguisher as well for your convenience. Your kitchen will always be up to code when you partner with Flue Steam. When you’re a commercial kitchen manager, you always have so much on your plate. Your To Do list is unending, and sometimes certain tasks get left behind and forgotten. If you realize that you need a commercial kitchen air control or fire prevention task that hasn’t been taken care of in too long, you don’t have to stress out. Just call the experts at Flue Steam and we’ll take care of it for you right away. Don’t risk code violations or costly kitchen fires by hiring a discount, unreliable exhaust system cleaning company. Trust your commercial kitchen air control and fire prevention needs to Flue Steam and you’ll be able to rest assured that all your needs with be dutifully taken care of. Flue Steam has been in this business for over 40 years – longer than any other contractor – and we look forward to fulfilling all your commercial kitchen air control and fire prevention needs anywhere in Southern California. Contact us today by calling 800-700-FLUE or email contact@fluesteam.com.